This test methodology uses the direct approach to evaluate power amps. The output of an auxiliary power amp drives either a speaker or (through an attenuator) the input of the tested amp (Fig. 1), whose output then drives the speaker. An A/B switch and precise level matching allow instant comparison of the tested amp’s input and output signals. 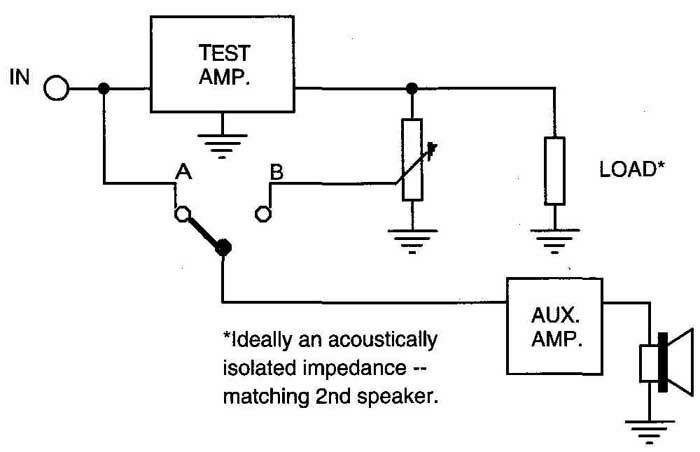 Ideally, the auxiliary amp’s load in switch position B (feeding the test amp) should be a second speaker whose impedance closely matches that of the auditioned speaker. To avoid the error potential due to changing loads, and the power limitation (to that of the auxiliary amp), you can use the setup of Fig. 3 here the auxiliary amp always drives the speaker, and “listens” to either the input or out- put of the test amp. Both amps see a constant load versus switching. But I chose the setup of Fig 1 because I wanted the tested amp to directly drive the speaker, as in normal use. 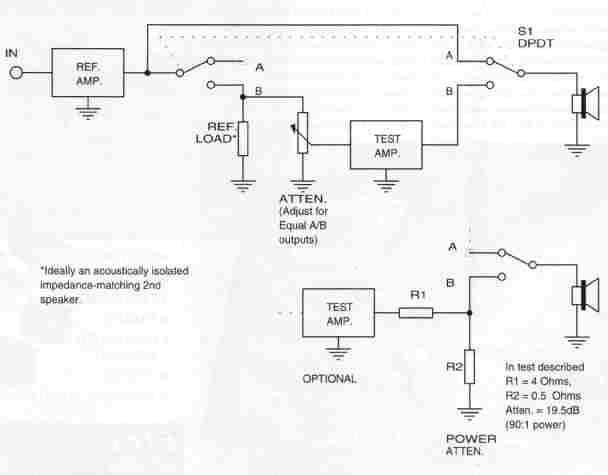 Also, Fig 3 requires a second speaker to correctly load the test amp, while in Fig 1 that’s taken care of; and you can replace the “dummy load” speaker for the auxiliary amp with a resistor if that amp has a high damping factor and produces small changes versus load, compared to those produced by the insertion of the test amp in the path. The auxiliary amp’s “sound,” if reasonably transparent, doesn’t matter; I considered its output the audio source throughout the testing. In conventional A/B comparisons of two amps, you may prefer one over an- other, but that doesn’t necessarily mean it’s better in absolute terms (more faithful to its input source). It could have deviations from neutrality that perceptually compensate deficiencies elsewhere, or simply sound prefer able to the other amp. FIGURE 1: Sonic comparison of power amp output vs. input. Ideally an acoustically isolated impedance-matching 2nd speaker. In contrast, the test described here al lows you to hear only the colorations of the test amp. If it were the ideal “piece of wire with gain,” the switching would pro duce no difference (other than the unproven claims of the microscopic audibility of short pieces of wire, and so on). In Fig. 2, the speaker monitors the test amp’s output-input difference signal (assuming a non-inverting amp). With sufficiently flat frequency response and low phase shift, you can ad just the attenuator for a deep enough null so that distortion residues can be directly heard, if sufficiently present. The tested amp was “Mad Katy,” a 125W per channel stereo unit, each channel comprised of four KTS8s in push-pull Class AB with 67% screen tapping (nearly triode but 2x power) and non-feedback output stage linearizing. To (more or less) double any deviations from neutrality, the two channels were cascaded, each attenuated to unity voltage gain. The first channel was resistively loaded; the second drove the speaker. The auxiliary amp was a 3W single-ended EL84 unit with a high enough damping factor (15W/8-ohm load) so that the changing load (8-ohm versus the speaker) was apparently of no sonic significance. The speaker was the Swans M1, a very high transparency system with a ribbon tweeter. Its excellent coherence, even in the near field, allowed close monitoring (1M) for optimum in-room clarity. J per formed the test in mono. With 12 music selections and white noise, I performed switching with long segments, and also with rapid repetition of the first two seconds or several notes of the piece. With the latter, the exact and frequent repetition with input/out put switching was a most sensitive test. I didn’t hear any obvious difference, so I continued switching for several hours. Any difference I occasionally thought I heard was on the edge of my perceptibility threshold. But this first test was limited to 3W with a 125W per channel amp (basically a low-level transparency test), and the tested amp has a high damping factor (>20, 40Hz— 10kHz) which delivers a very flat frequency response to the speaker. The high DF is obtained from a local cur rent FB loop (no global FB is used). In the previously described test, the test amp’s channels were each attenuated to unity overall gain. But because the auxiliary amp’s maximum power is about 3W, the test amp (125W per channel) output was also limited to 3W. In a second test, a power resistor net work attenuated the test amp’s output by 19.5dB (90:1 power ratio). A/B levels were re-matched. Now, with 1.4W from the auxiliary amp, the test amp was driven to 125W, with 1.4W reaching the speaker. A drawback of this method is that the power attenuator presents a nearly resistive load to the test amp out put, isolating it from the varying and re active speaker impedance. To eliminate this drawback, the auxiliary amp would need a maximum power capacity comfortably greater than that of the test amp; this wasn’t available. In this test, admittedly with the unfairly “nice” test amp load, little if any audible differences could be established. But levels approaching clipping (estimated 2% THD on peaks) effortlessly revealed the distortion. With the test setup of Fig. 2, I achieved a null of over 30dB. With the resulting low SPL, my sensitivity to anomalies was certainly impaired. But for what ft’s worth, the sound was not noticeably distorted until overdrive became (rapidly and most detectably) audible as the drive level was increased. In a previous test with a different speaker, whose impedance drops to 3-ohm from 5 - 20kHz, the amp produced a slight “softening” when I used its 4-ohm tap. This also occurred with the Swans M1 (7-ohm at 300Hz and 20kHz) when driven by the amp’s 8-ohm tap. I heard no “softening” with the 4-ohm tap, which I used in the tests. With this amp, you should use a tap (2, 4, 8-ohm) that’s lower than the lowest speaker |z| within the audio band. FIGURE 2: Audition of power amp output-input difference. FIGURE 3: Alternate test methodology. However, I had previously compared several amplifiers in conventional A/B switching tests, and had no difficulty hearing small but obvious and consistent differences. Compared with the “Mad Katy” tube amp, two solid-state amps (conventional Class AB, good but not audiophile quality) sounded more “crisp” (artificially so, I think). Also compared, my 1960 vintage H.H. Scott Stereomaster 222D amp (20W per channel push-pull 7189 tubes, pentode, lots of global FB) sounded slightly “soft” and less detail-resolving--slightly less overall clarity. By “slight,” I mean about three times my audibility threshold. If anyone would like to try the “intrinsic fidelity” test on any amplifier(s), we would welcome a report on the results. Hours spent with an A/B switch, precise level-matching, and a highly transparent and neutral component, can be very revealing not only of the component, but also of the influence of “expectational bias” (and other thought-process activity) on your perception. Blind testing, ideally with a pre-noted but random-appearing A/B sequence, can eliminate this influence. But with the auditioner also doing the switching, you must persist with extended switching repetition, until you can suspend all thought by forgetting about the test purpose and becoming “absorbed” into the music. At any given moment, you can think or observe, but not both together with full clarity. and freedom from grain of SACDs versus 16/44 CDs. I can hear differences between most of the amplifier pairs I’ve compared. On a very few occasions I might have heard differences in speaker cables (with long cables such as 12’). I have not heard the “sound” of different (good quality) connectors, well- constructed clip leads (I know, heresy!) or a few trillion copper oxide atoms. These tests are simple in concept and most likely not new. I present them here to remind you that—amid all the controversy regarding “euphonic colorations” versus “musical truth,” and so on—you can evaluate an audio power amplifier without comparison to another unit, but directly.